The function of a mattress is the same for everyone. To find the optimal sleeping surface for you. Making sure that you have a mattress with proper support and comfort is necessary regardless of your size. However, if you are a larger or heavier person there are a few things to look for to ensure you will have a mattress that will provide you with the best night’s sleep. In this section of best mattresses for heavy people we focus on mattresses that have solid, durable foundations, proper edge support and a thicker profile. These qualities are important in narrowing down which mattresses will perform best and get the most life out of. My father happens to be 6’3″and about 260 pounds and I would feel confident in recommending any of these mattresses to him, as well as you. *Below our recommendation list is a thorough guide of what to look for in a mattress if you are a heavier or larger sleeper. It is a great reference to know what mattress may work best for you to ensure a supportive yet comfortable bed that will hold up for the long haul. When it comes to the mattresses made by Brooklyn Bedding you know you will always get quality for a great price. This is no different with their Titan mattress made specifically for the larger sleeper. This hybrid bed is made to give premium support and ideal comfort for a bigger framed individual. However, it doesn’t make you pay and arm and leg to get it. Our #1 pick for the best mattress for heavy people is less than a thousand dollars. Making the Titan a steal of a deal all while providing exactly what your body needs and wants. Titan Coupon: SAVE 20% HERE! This 11″ thick bed uses 5 layers to create a firm yet plush sleeping surface made specifically to accommodate more weight. Though it is also great for any sleeper who wants a more sturdy mattress, it is ideal if you are in the market for a mattress built for larger sleepers. Combining a super heavy gauged steel coil system with more resilient and longer lasting foams makes this bed ideal. However, the price point is much more affordable than several other niche mattresses geared towards heavier sleepers. Which makes it so much more appealing when you don’t have to compromise quality for price. This is why we love the Titan for larger sleepers and know that you can have a well made bed that keeps your budget in check too. 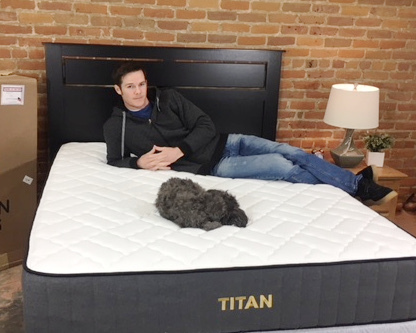 Learn more about this affordable yet super durable mattress in our full Titan by Brooklyn Bedding Review or shop our #1 pick at TitanMattress.com. With the recent updates to Helix the important addition of a “Big & Tall” mattress was added to their line up. This more durable and dependable hybrid mattress earned it a spot on our lineup. The solid 8″ reinforced coil system is topped with three dense layers of comfort foams. All working together to provide a comfortable surface that will last for years. 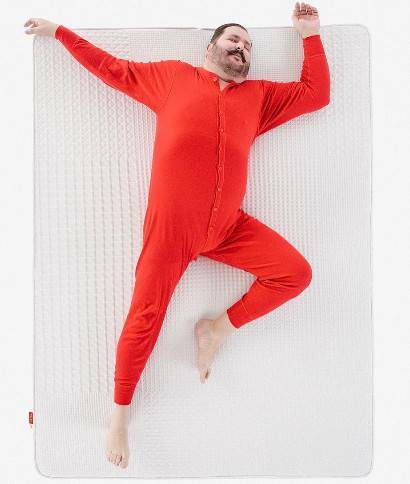 With maximum support combined with a medium feel that will accommodate any plus-sized sleeper with ease. Save BIG On Your New Helix Nightfall HERE! The Helix Nightfall not only offers ideal construction and materials but several other benefits that will be perfect for larger sleepers. the reinforced perimeter creates great edge support. While the natural air flow of the coils combine with more durable foams creates a cooler surface. Not to forget the optional cool to the touch cover too. And the affordable price tag certainly doesn’t hurt either. Make sure you also take advantage of the latest coupon too. Making an already affordable mattress a steal of a deal. Learn more about this one of a kind mattress in our full Helix Review or shop our #2 pick at HelixSleep.com. The Cedar by Brentwood Home is a close contender for the #1 spot in this category. This latex hybrid bed is not only durable as can be but also one of the naturally coolest mattresses you’ll ever try. This thick mattress utilizes 4″ of the most durable Dunlop Foam over another 8″ of thick gauge steel coils. Creating a combination of solid support and ample comfort. The Cedar is about as premium a bed as you can get. It offers an ideally medium to medium-firm feel that is plenty supportive. As well as materials and construction that don’t falter with time or use. Even for a more robust figure this mattress won’t alter from its original feel over the years. Another area to note about the Cedar is it’s natural materials from top to bottom. This bed uses two layers of 100% natural latex. Along with wool batting and organic cotton. Even the reinforced steel coils are recycled and the flaxseed fiber pad above them provide a natural barrier between the coils and latex. 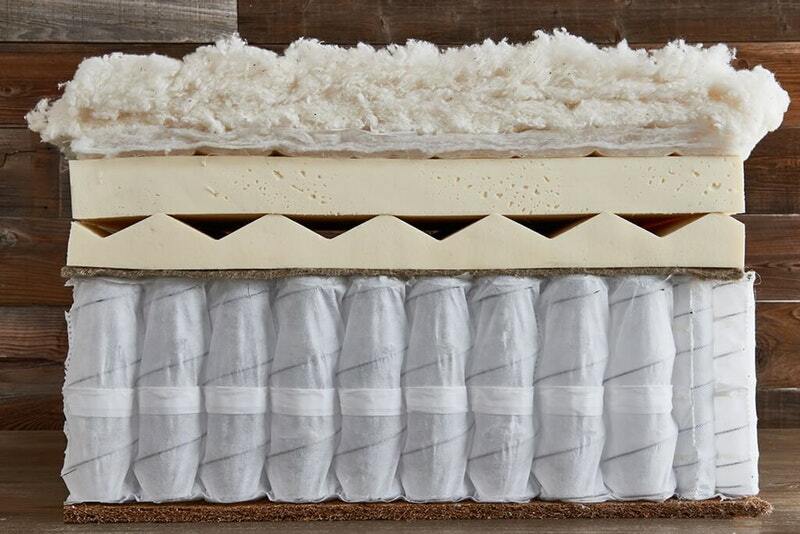 The base is made form coconut husk that is more supportive and sustainable than foam too. Creating a very healthy sleeping surface. As mentioned above this mattress is our go to suggestion for anyone who sleeps warmer too. Between the top notch construction and ideal materials you get a mattress that is great for so many people. But especially great for warm sleepers who are on the heavier side too. Giving the #3 spot of our top mattresses for heavier people to the Cedar by Brentwood Home. And how could we forget about our exclusive 15% off coupon, saving you TONS! Just use code: OURSLEEPGUIDE15 at checkout to ensure you save several hundred dollars on your Cedar. Learn more about this amazing mattress in our full Cedar Review or shop our #2 pick at BrentwoodHome.com. When it comes to the Plus WinkBed you get a wonderfully thick and already well made mattress that is upgraded to be even more ideal for larger sleepers. This mattress might be a little more money, but with it you get so many specific benefits that will help you get great sleep. As well as a bed that has superior support and rock solid edge support. Making it one of the best beds on the market for larger sleepers. Even though it has amazing support from every angle it also seriously comfortable. Coming in at an ideal medium-firm feel for anyone over 300 pounds. WinkBeds Coupon: Save $50 & Free Shipping HERE! The WinkBeds Plus model is meticulously constructed and uses ample and durable materials. The benefits from these are perfect for larger sleepers. Including in the WinkBeds Plus is a lumbar layer for perfect spinal alignment. Triple layer heat dispersal layer for sleeping cool. And extra edge support as well is minimized motion transfer from not only the foams but the solid coil system. Let’s not forget the body impression proof foam and zoned latex support layer. Making all the bells and whistles on this mattress worth every extra penny you feel like your paying. However, after all is said and done, the value of this mattress is amazing and only comes in at $1449. Learn more about this one of a kind mattress in our full WinkBeds Review or shop our #4 pick at WinkBeds.com. The Luft hybrid bed has proven to be solid and durable for many a sleeper. Proving to have one of the best perimeter support of any bed we have tried. 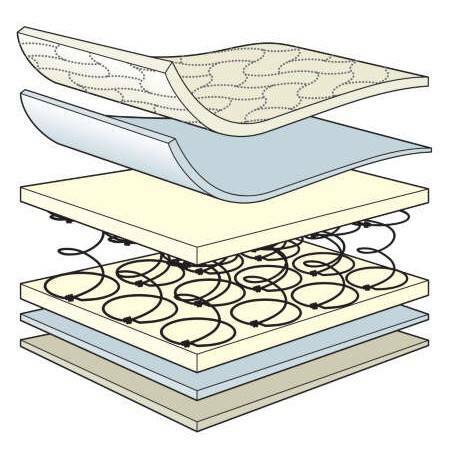 This mattress uses a coil system with edge support coils around the exterior. 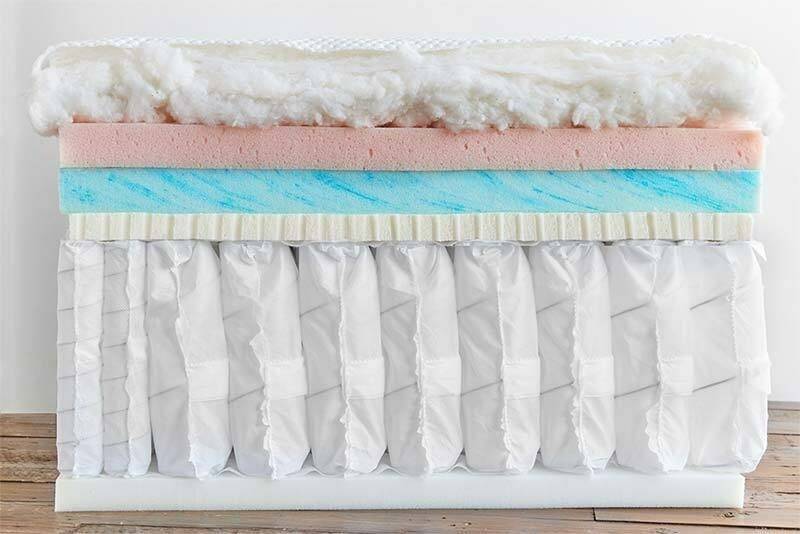 Paired with several layers of dense and solid foams makes for a sturdy mattress from top to bottom. And easily putting the Luft Hybrid in our 5# spot. Along with the solid build and materials also comes an ideal comfort and supportive feel. Ranging from a medium to medium-firm depending on your size. And working well for all sleeping positions. This mattress conforms to your body but doesn’t sacrifice support to do so. Giving it an ideal feel that isn’t too soft or feels like it will sag with time. Luft also offers a 10 year warranty and 100 night sleep trial. And with our exclusive $125 coupon with code: OURSLEEPGUIDE125 this mattress comes in at an amazing price. At only $974 for Queen size along with free shipping too. Giving this hybrid the greatest edge support and best price for our lineup. Learn more about this amazing mattress in our full Luft Hybrid Review or shop our #5 pick for larger people by clicking below. The Big Fig mattress is one that is made specifically for the larger frame. This company has designed its mattress intentionally for larger sleepers. Using dense and durable foams and coils to ensure proper support and durability. The Big Fig hybrid bed even comes complete with a heavy steel frame and amped up foundation to make sure the mattress has a solid base. Though this mattress may be marketed towards a bigger crowd it doesn’t mean that an averages sized person won’t enjoy sleeping on this bed. The medium-firm feel still is very comfortable for many shapes and sizes and the ultimate support will last for many years. This mattress also has a more substantial warranty to coincide with the materials and construction of this bed. As well as free white glove delivery and a 100 night sleep trial period. If you are looking for mattress made specifically for a larger figure, than the Big Fig may be perfect for you. Make sure to get their latest coupon too to save extra money on this bed. Learn more about this amazing mattress in our full Big Fig Review or shop our #6 pick for heavy people by clicking above. The Ojai by Brentwood Home is their most affordable option. Though the price is lower don’t let that fool you about the quality of this bed. It is made with the same 8″ thick coil system that is used as the foundation in all of their beds. Giving it a solid and sturdy core that is durable and will last many years regardless of size. 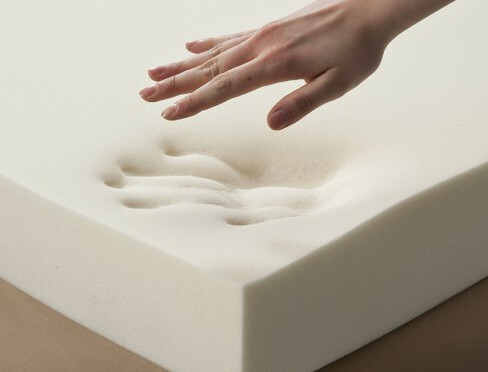 The combination of memory foam, latex and poly foam give it a balanced and appealing feel. With a medium to medium-firm level of firmness and appeal to many sleepers. This mattress has many exceptional benefits including sleeping cooler, great edges support and minimal motion transfer. The Ojai also incorporates the health and safety standards Brentwood Home is known for. Ensuring a solid yet very sustainable and non-toxic product. Also coming with free shipping, 120 night sleep trial and 25 year warranty that is hard to beat. On top of that use Our Sleep Guides 15% off exclusive coupon to make this mattress just a shade over $1000. With coupon code: OURSLEEPGUIDE15 you can get one of the most durable and well made mattresses at this price point that is even fantastic for a larger sleeper. 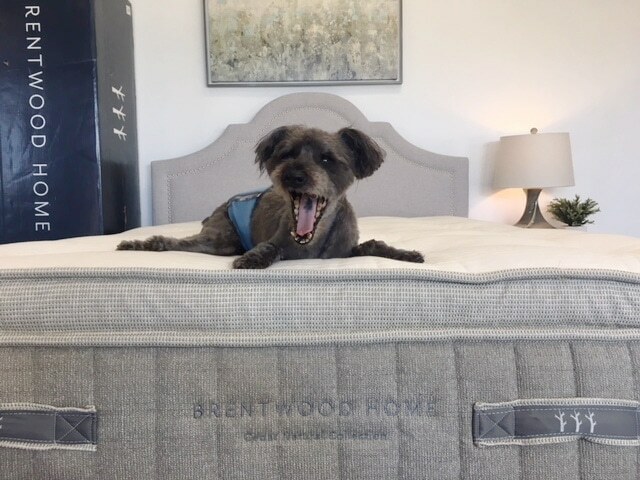 Learn more about this amazing mattress in our full Ojai by Brentwood Home Review or shop our #7 pick for this lineup by clicking on the button above. This tried and true mattress has several reasons why it is a good choice for larger people. First of all it has two coil systems. One that is the majority of support and an added layer for more flexible and conforming support. Since coils last longer than foams having more than less just makes for better support and wear long term. Secondly, the Saatva is NOT roll packed. Though this very rarely compromises the integrity of the mattress it may prevent the use of certain materials that are denser and more durable. But not with this bed, you are getting the finest bed and is delivered for free with a white glove delivery service that never compresses the mattress. A few other benefits of this mattress are also the options of firmness. Thought many of the other mattresses we recommend area great quality very few offer you the chance to choose the comfort level that suits you most. With the Saatva you get to choose between the plush soft, luxury firm and firm. All using the dual coil system with varying densities of foams to appeal to softer or firmer preferences. Not to mention the other choice of having a 14.5″ thick bed or 11.5″ thick bed. By not altering the materials other than the coil height to obtain this 3″ difference. As well as great edge support, plenty of air flow and heat dissipation to sleep cool and an awesome price point. As well as a thorough 120 night sleep trial, 15 year warranty and one of the best customer services in the mattress industry. It is easy to see why this mattress would be great for larger sleepers, or any sleeper for that matter. Learn more about this amazing mattress in our full Saatva Review. If you are in the market for a new mattress but are worried it may not have the durability or support for your heavier weight, no problem. There are a few key factors will help you figure out which mattress will be ideal for you. Below is an easy to read guide that will go through several elements of design and materials to focus on during your mattress search. Having a more substantial mattress means that there is more materials and more materials means that you have a more solid, durable mattress. All of these mattresses are a minimum of 12″ thick and use several layers of dense, high quality foams and coils to create these beds. Also these mattresses are going to provide more deep comfort because they are thicker. Deep comfort describes the comfort layers that you would experience when you sink deeper into the bed. This is important because you want to feel supported but you don’t want to literally feel the support layer. Being able to utilize the full sleeping surface of your mattress is important no matter your size. But when the edge support is sub par it doesn’t take much to feel like you are rolling out of the bed, and no one wants that. Finding a mattress that has an edge that feels solid and stable and really allows you to utilize the full mattress is important. You want to be able to use all the space you can and the only way to do that is by having a mattress that has good edge support. This can be done by adding reinforcements in the form of foam encasements, border rod and denser heavy duty materials overall. All of the mattresses chosen for this category are built to utilize the bed in full for even a heavier person. The core, or foundation of the mattress, is where the durability, longevity and proper support come from. This layer may not be the sexiest but it is one of the most important for proper spinal alignment and necessary support to keep you comfortable. The support is going to be provided by a thick layer of dense foam or by a coil system and sometimes a combination of these. The mattresses in our top beds for heavy people include both all foam and coil mattresses. 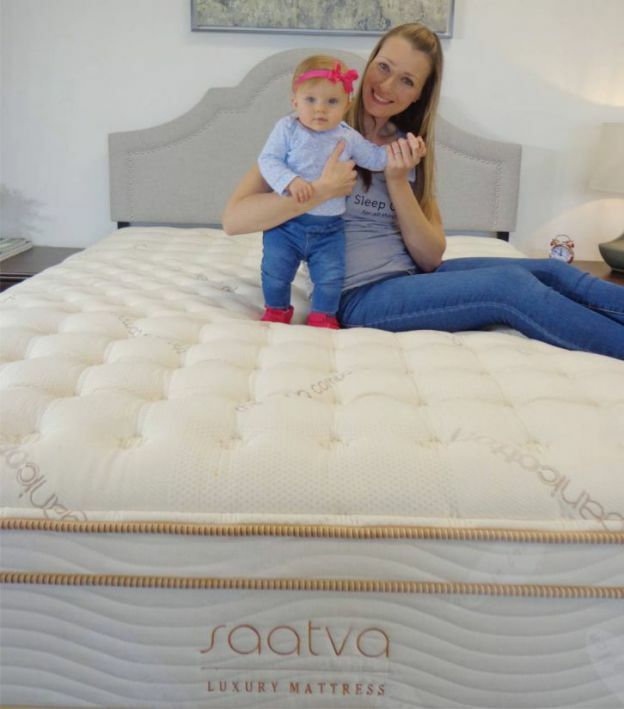 The Saatva is a coil on coil mattress that has two coil systems layered on top of each other to create a 14.5″ thick bed that won’t disappoint in quality or comfort. Having a dual coil system really adds the extra support for a larger sleeper. The foams are supportive and dense and the construction is top notch. Get the latest pricing and shop the Saatva coil on coil mattress! 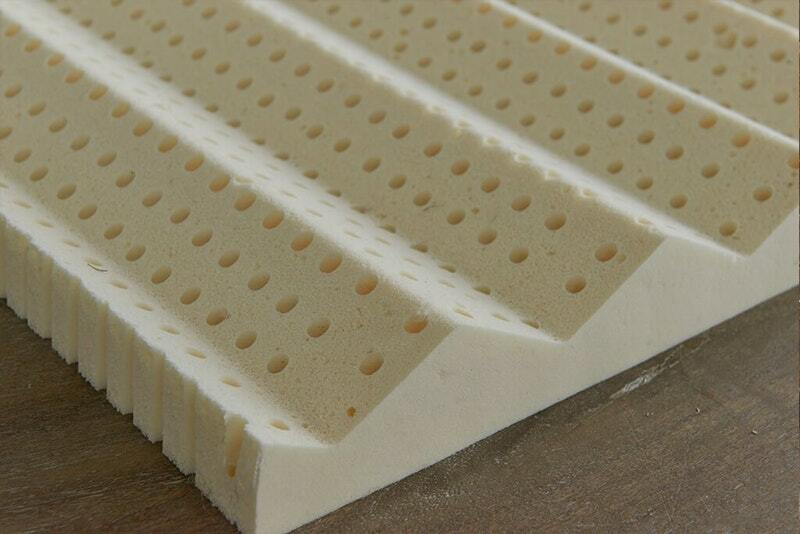 A hybrid latex mattress is not only going to provide insanely durable materials that will hold up for a long time. It also is going to be great for keeping the mattress a little cooler too. The Cedar by Brentwood Home is all that and more. This natural mattress uses the highest quality materials for a great feel as well as a health sleeping surface. The pairing of all the materials makes for a mattress that is ideally comfortable and more than supportive too. The thick and solid coil system is joined by dense and durable yet very pressure relieving ad comfortable layers of Dunlop latex. This combination makes it perfect for heavier sleepers as well as anyone who likes an natural mattress that will sleep cooler too. For a solid and durable mattress you can even save a little with our exclusive 15% off coupon too! Shop the Cedar by Brentwood Home and SAVE 15%! The Big Fig is a hybrid mattress specifically designed for the larger frame. This premium niche mattress uses dense and supportive layers to create a thick and durable mattress that holds up to a 1000 lbs comfortably. The Ojai by Brentwood Home is another hybrid that is super thick and durable. It uses very dense premium foams with a sturdy coil system and the best construction for a solid yet contouring feel. This mattress is a great price for such a luxurious feeling bed too, especially with our 15% off coupon. 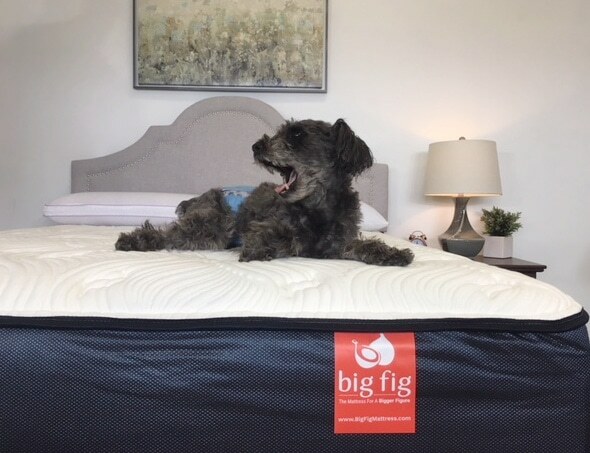 Shop the Big Fig mattress and the Ojai by Brentwood Home! The WinkBed Plus and Luft mattresses are two other hybrid options. They offer sturdy, quality coil systems along with several layers of dense comfortable foams. The WinkBed Plus is about 14″ thick. It is made specifically to accommodate a larger sleeper. While the Luft mattress is about 13.5″ thick and available in three feels with the firmest option being most ideal for overweight sleepers. Both are very affordable and well made, make sure to get our coupons for both. Shop the WinkBeds mattress and the Luft hybrid mattress! For a larger sleeper that likes an all foam mattress looking for something thicker and well made is best. 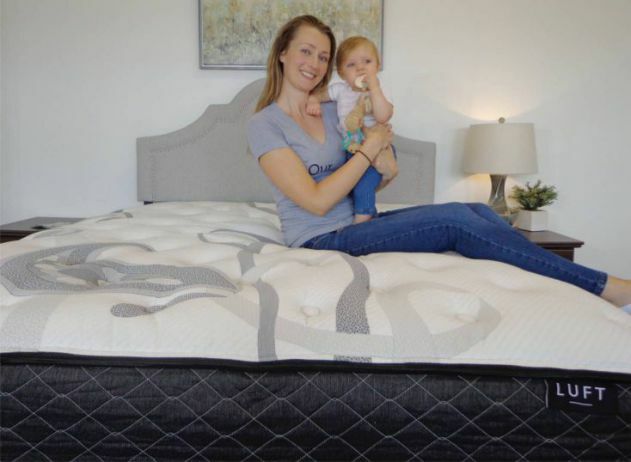 The Loom & Leaf mattress is a thicker memory foam mattresses. Offering a luxurious all foam mattress with a very solid foundation and dense memory foams used throughout. It even comes in at 12″ thick. The solid components of this mattress are great for contouring without breaking down as easily as several thinner counterparts. It is also great for the budget too. All of these mattresses use quality materials to create substantial, quality mattresses that work great for everyone. However, they may feel a little different depending on how you like the feel of your bed to be. Make sure to consider the fact that many of these mattresses list a rough firmness range of how these beds will feel on average. If you are a heavier person the mattresses may feel just a tad softer to you. So that is just something to consider when trying to figure what feel is best for you. More than likely you won’t want to go with anything lower than a 5 on a scale of 1-10. 1 being soft and 10 being firm. This is important from the perspective of longevity as well as proper support. Also, any mattress will just get softer over time, so having something that may feel a little firm at first may be more ideal long term. Thank you for checking out our take on the best mattresses for heavy people.